Showing results for tags '48'. 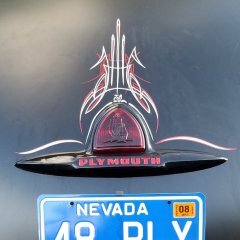 I have a 48 Plymouth special deluxe and havent been able to get this motor to start. It cranks and I put gas in the carb trying to get it to start. Though when I was working on it my stud that the positive cable bolts to got really hot. Wire isnt hot but just the bolt. I get the motor to crank and sounds like it wants to start because it does pop but cant get it to run. i'm putting glass in my 48 and need any suggestions on how to do it. I tried watching videos on you tube but the only one i see is a 41 plymouth front door and it's not the same as my back doors which don't have the extra room from the vent windows. I'm in the market to replace the rear leads on my 48. Couple of guys on here said they have swapped 49 springs in place. Went to the spring shop here in town and the old guy whipped out a book from 1956. According to the book the only difference between springs from 37-52 is deflection rate and the amount of leaves. 37-48 are all identical. From 49 on less leaves and deflection rates. Measurements are the same. My question is anyone swap to the 49 and later springs what rate did you use and what were the lowering measurements from original. Stock 48 springs are 800 lbs for standard duty and 1000lbs for HD. Later rates range from 520, 600, 640, 700. No springs from 49 on were over 700 unless they were on a wagon. Thanks. Adelaide, Australia, assembled, owned and driven...low and slow!